Dang, it's been awfully wet around here. I don't know about you, but I'm getting tired of the rain. I didn't get the Lab web feet from one of my parents. They might have been handy to have last week. My swimming pool only had about 3" of water in it before last week. Now it's full! They say rain water is good for your fur. I should have really, really soft fur by now. I don't, they lied. Although, it has been fun to go out, play in the rain and then come in and jump on Mom's lap. Wiggling on her lap to dry off is fun, too. Enough about my adventures, here's what's new in the Shop. Mom and Elizabeth have been doing some reorganizing when they have a free moment. They say they have a long way to go but at least it's started. Our Gingham scissors and specialty scissors have a new display area. Our sewing machine light bulbs, lights, feet, lint brushes, etc. also have a new display area. Mom has revamped our website to make it easier to navigate, find directions, web store and information on sewing machine service/repair. Our sewing machine service/repair policy is also on our website. We will be getting a new logo and website in the near future. We are just waiting for modifications to be made on our logo and then we will begin our new website. Our new website will be more user friendly and an all new appearance. We'll keep you posted on our new logo and website. We are also going to try to start doing more "live" videos on Facebook. We are planning on doing them on Saturday afternoons around 1pm. 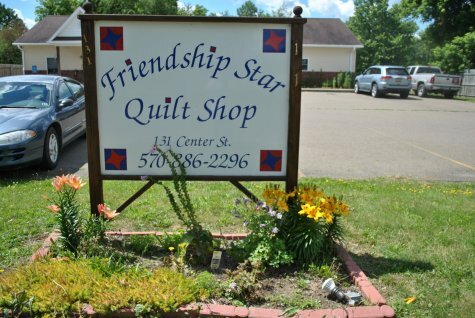 They will be a wide variety of topics covered and will help both new and experience quilters. We will not be going "live" every Saturday. If we get too busy, we will have to forego the "live" broadcast. As you can see, we have some pokers in the fire. There are a few more pokers but all in good time. Saturday August 4th is our Free Pattern and Demo Day. 10am-11am We will have a Door Prize and light refreshments. Grandma has made several samples of this month's free pattern. It's really easy and apparently very addicting from the looks of the classroom. Elizabeth is with us for about another month and then she's off to college again. If you've been meaning to stop in and see her this Summer, time is getting short. She will be gone most of next week, too. We've gotten most of our Christmas fabric in. There are still some stragglers out yet but they should be coming in soon. If your looking for more lighting to put on your sewing machine, stop in and we would be happy to show you some of the extra lighting we have to chose from. Do you have an older sewing machine that keeps burning you with it's hot light? We have in stock LED push in replacement bulbs. Not only are they brighter but they're cooler, too. I think I've covered most all of the exciting news around the Shop. If your not sewing, this would be a good time to bring your sewing machine to get it professional serviced to get all the fuzzies, broken needles, stray threads out of the hidden places in your sewing machine. Believe me, when I say they get everywhere. While getting rid of hidden fuzzies and other debri, your sewing machine will be cleaned of old oil, grease and gunk. New oil and grease applied, tensions and timing checked to make sure your buddy is good working order for the sewing season. You don't want her to give you problems in the middle of a project that needs to be done right away. Good-bye for now. I need to go supervise Grandma. I think I heard her go into the kitchen. The dog treats and peanut butter are in there. She may give me something tasty.